July 27, 2014 — It was 5 am. 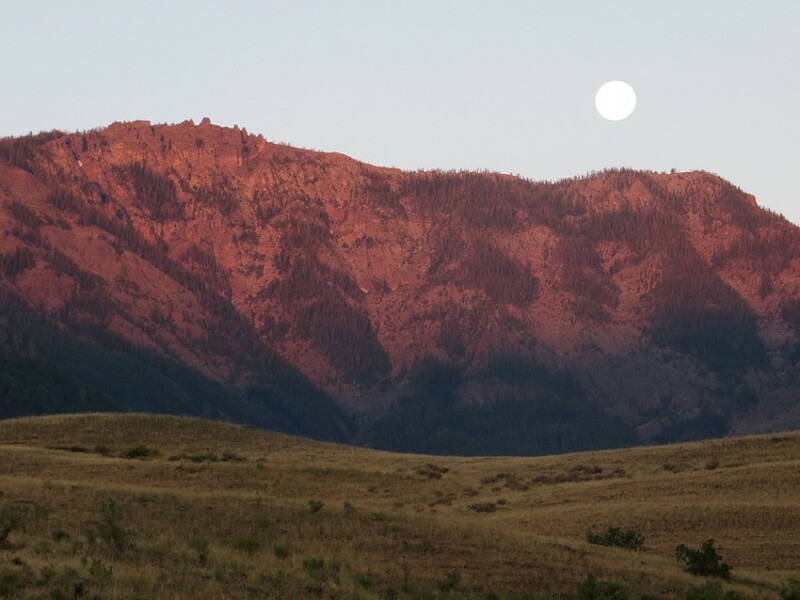 The sky was a groggy blue, and the Supermoon still hung defiantly over the mountains. We were in the middle of the town of Gardiner, filling up at a gas station branded with a green brontosaurus. Down the center of the main street, past all the shops and restaurants, walked a large brown elk. That’s just townie life on the edge of Yellowstone. It made me think of the opening credits from Northern Exposure. Probably because we had just visited the town where it was filmed a day or two before. I hummed the theme song the rest of the day. We got up that early for two reasons: One, we had to leave at some point for a nine-hour drive to Denver, so the earlier we got up, the more time we’d get to spend in the park. Two, we wanted to see animals. Not the horned ungulates we’d seen the previous night, but the types of animals that would make us drive in reverse for miles out of sheer terror. You know, bear and moose and wolves and such. We’d heard that dusk and dawn were the best times to see them. Yellowstone is huge, large enough that if you have kids in the back seat, you might get an “Are we there yet?” between points of interest. It took us about 45 minutes to reach the Lamar Valley from the north entrance. The opportunity of an animal encounter can happen anywhere in the park, but we had read that our best chance of seeing those types of animals was there. It didn’t take us long to realize we weren’t going to. 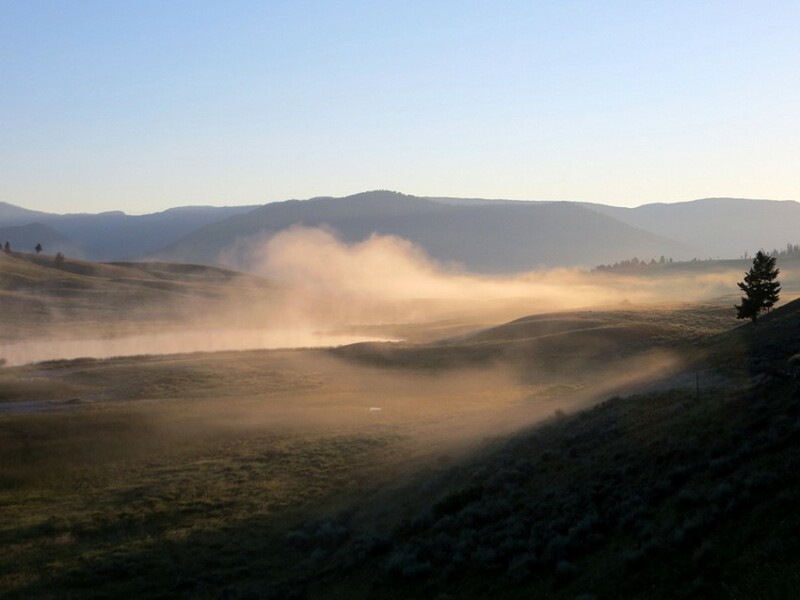 The Lamar Valley is this wide expanse of land, vast enough that the whole thing looks tilt-shifted, and the road only skirts its edges. As we drove it, we saw people parked on the side with telephoto lenses set on tripods and binoculars screwed into their eyeballs. Unless you’re hiking or taking a ranger tour, I guess that’s how you see animals in the Lamar Valley, from a distance. And while that might be close enough for Bette Midler, we didn’t have time for that. Nor really the desire. We wanted a squeal-our-tires, fumble-with-our-camera, hope-our-car-rental-insurance-covers-claw-marks animal encounter. 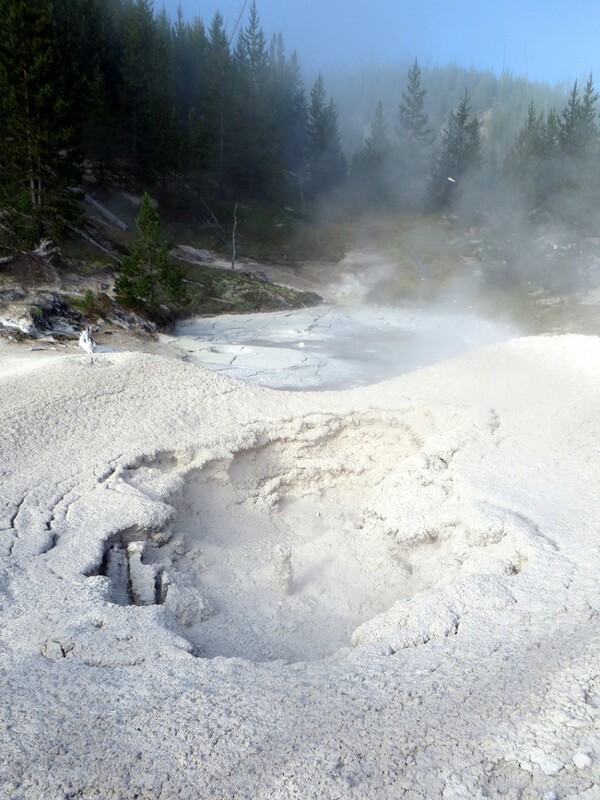 It was a bummer, but only slightly so, as the real reason to visit Yellowstone is to witness the strangest and most amazing geographical features on the continent. But just as we’d declared those grapes sour, we were buffaloed by a buffalo. Now, buffalo was low on my list. I’ve seen them up close on drive-through animal safaris a couple of times. Heck, there were herds of them in paddocks on the route to Yellowstone. Still, I can’t ever be disappointed at being three feet from one of these bizarre monsters in the wild. They’re so…alien. I mean, we usually reserve that term for the deep-water aquatic species, but buffalo deserve the descriptor too. I mean, these massive brutes have these shapeless shaggy heads that look like they’ve been grafted on by Dr. Moreau. 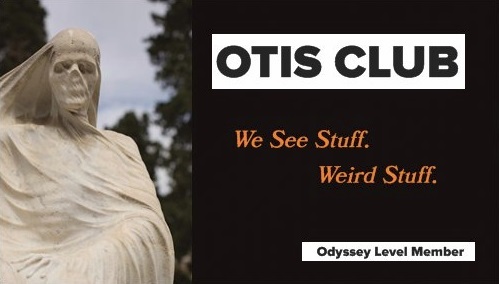 Mostly, though, it’s those eyes. Their cranium is so large and the hair so bushy that their eyes appear to be on opposite sides of their heads, like a lizard or a fish or Benedict Cumberbatch. 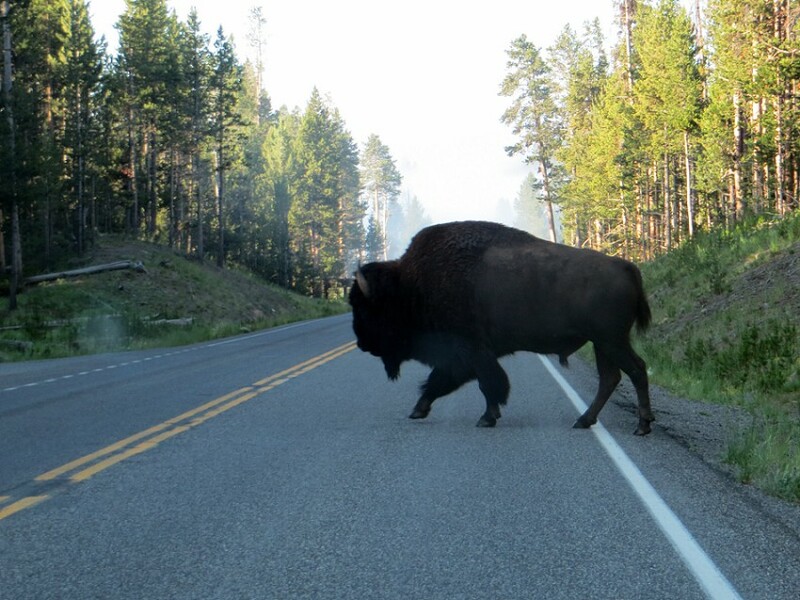 The buffalo was on my side of the car, and as we passed it, time slowed down as I stared into the one eye that was facing me, and I wondered why I saw pity in it. We stopped the car, hit it in reverse, and, as if that were its cue, watched it just ramble placidly across the road in front of us. We saw two other buffalo in our seven hours in the park that day, but nothing that close. And, honestly, those weird cow-lion-fish fit right in the alien landscape that is Yellowstone National Park. I mean, sure there are green forests and rolling hills and majestic mountains and picturesque streams in Yellowstone, but its signature features are all…otherwordly. And scalding. 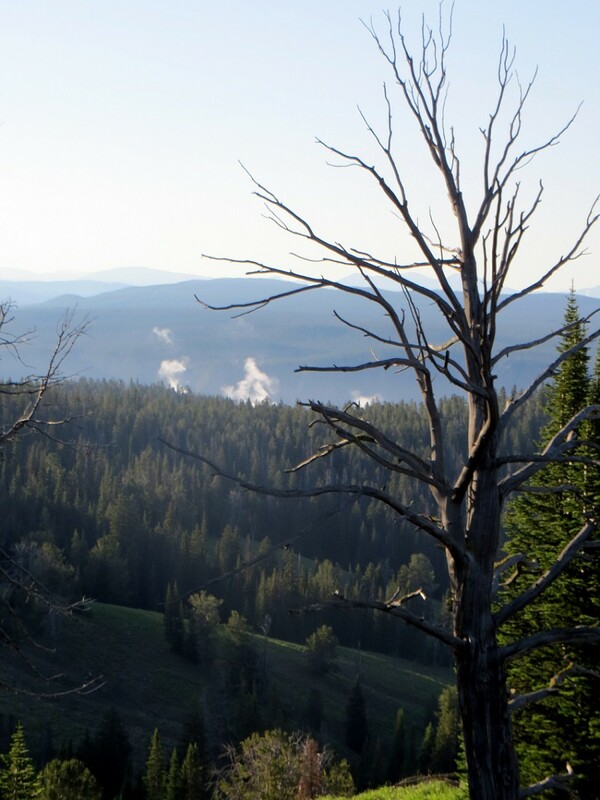 See, Yellowstone sits atop a volcano. 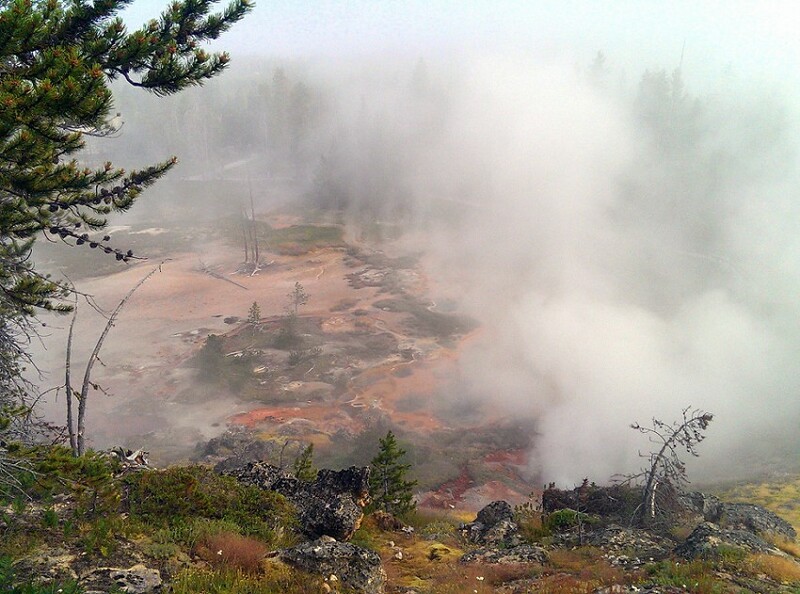 Actually, a supervolcano. Actually, the largest active supervolcano on the continent. That’s right. Active. This thing is the eventual bringer of our destruction. In fact, while we were there a loop of road had been closed off because the asphalt itself had melted into a morass. I mean, that’s a terrifying taste of what’ll happen to our infrastructure when that guy below stops being the Clark Kent that is a national park. 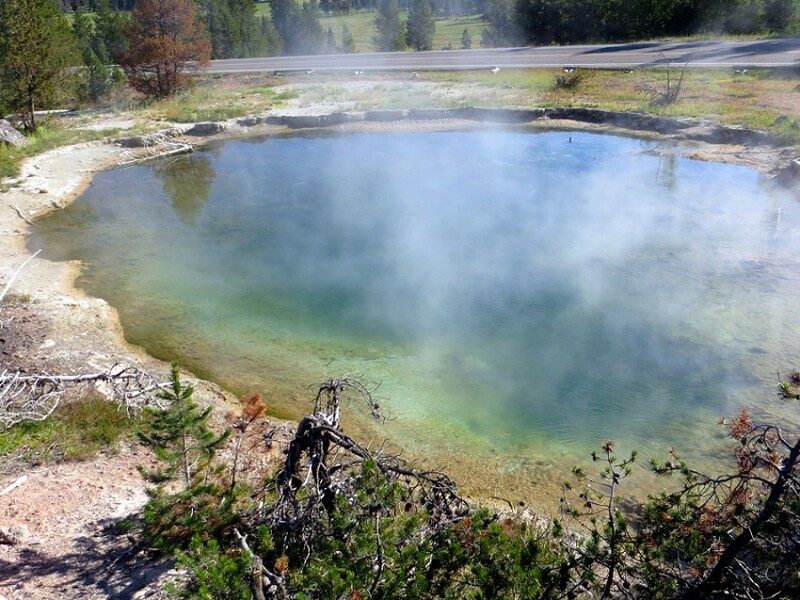 The central loop in Yellowstone features most of the sites resulting from all that heat: bubbling mudpots, hot springs, steamy geysers, boiling streams, wildly colored bacteria mats. You can see steam wafting on the horizon for miles as if the place were being devastated. The first site was saw was called Artists Paint Pots on the map. We parked in the lot and took a path through a forest. 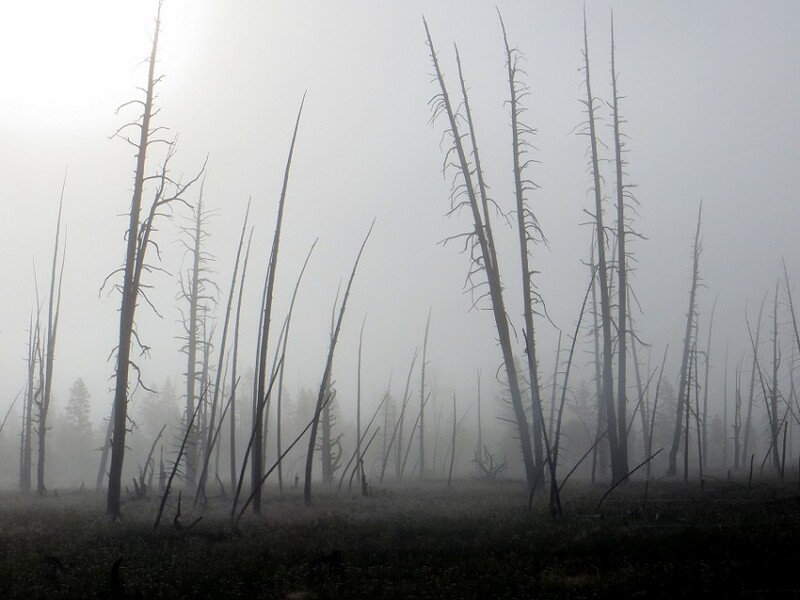 As we got closer to the mudpots, everything turned foggy and spooky and weird. I mean, I’ve been to Centralia, and that was an airy Kansas plain compared to thick atmosphere of this place. And this wasn’t a cool fog, either, it was a heavy, sulfurous miasma. The smell wasn’t too bad, less like rotten eggs and more like, I don’t know, steamed eggs. 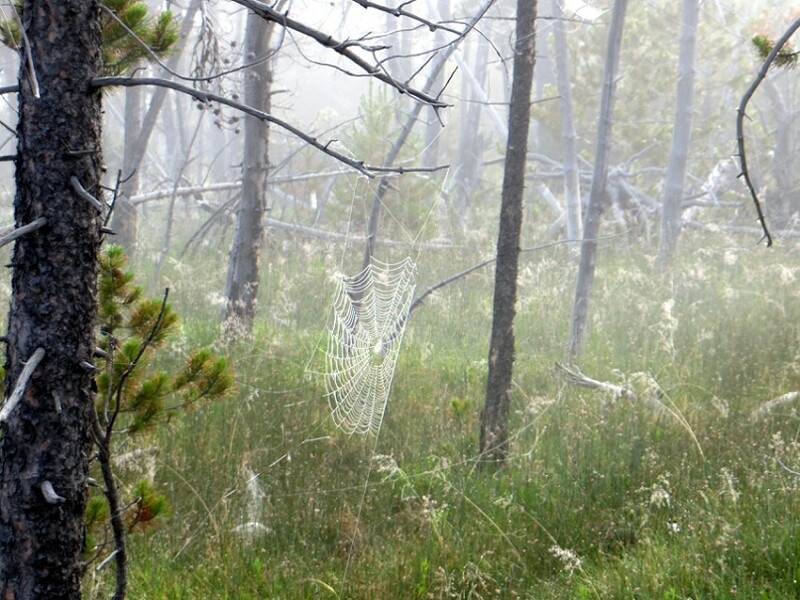 And that steam was so thick that it condensed onto the many spider webs that festooned the place, creating these brightly reflecting patterns that contributed to the eeriness. Eventually the path became a boardwalk and we were at the Paint Pots themselves. What we were looking at, in between shifts in the steam, was a whitish-grayish landscape textured like petrified cottage cheese and full of craters that were blooping hot white mud into the air far enough to splatter onto the deck of the boardwalk or bellowing columns of steam or filled with milky liquid, sometimes shot through with tints of blue or orange. 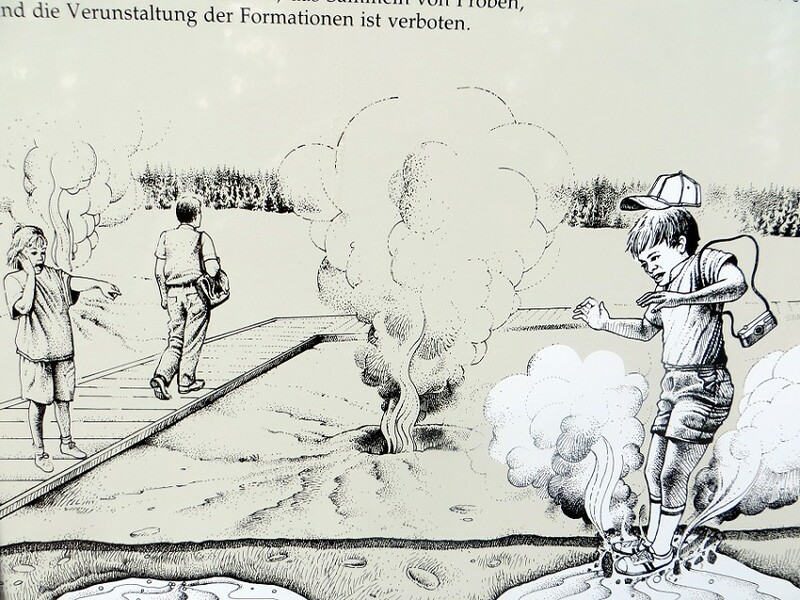 The cause of all this strangeness was microorganisms that consume the hydrogen sulfide that seeps from You-Know-What below the park, converting it to sulfuric acid, which breaks down the surrounding rock into gloopy clay. Regardless of the scientific explanation, the effect is like walking on another planet. This single place would have been enough to theme an entire lucrative tourist attraction around, but it was just one of the many sites offered by Yellowstone. 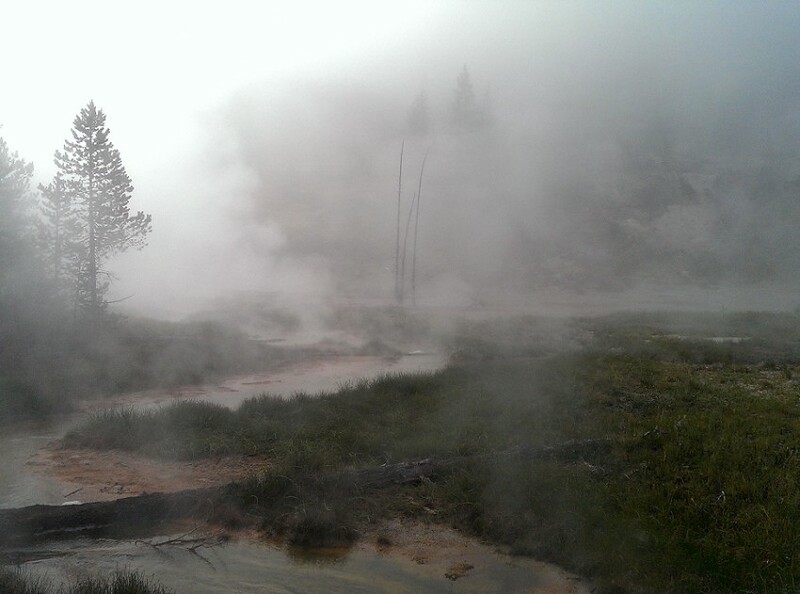 Like the Monument Geyser Basin, which we hit next. 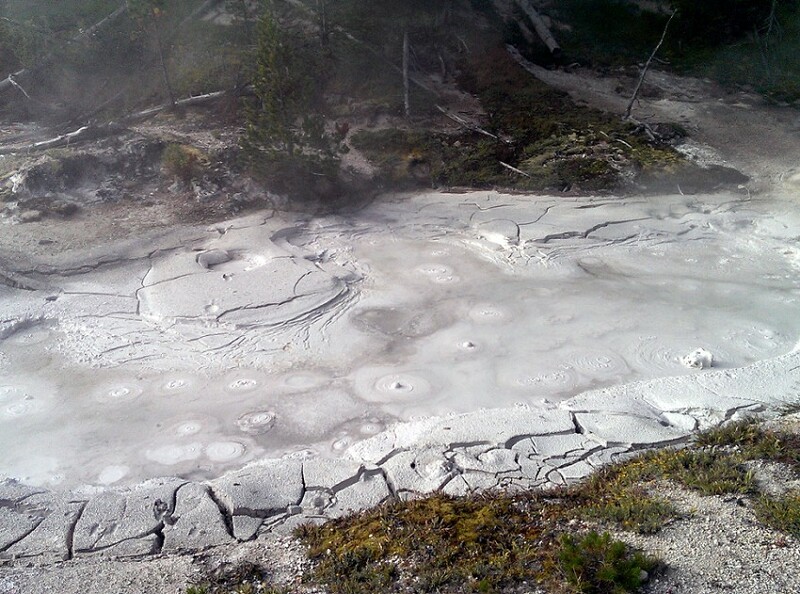 This is another strange landscape, flat and open this time, and with bacteria-hued pools and formations. 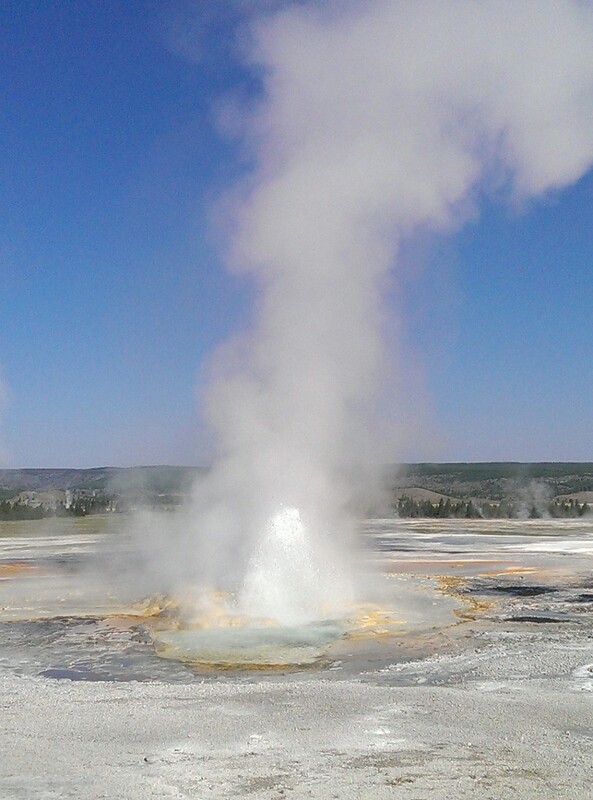 It was here where we saw our fist geyser, which for all the world sounded and appeared like a water hydrant that had been loosened. 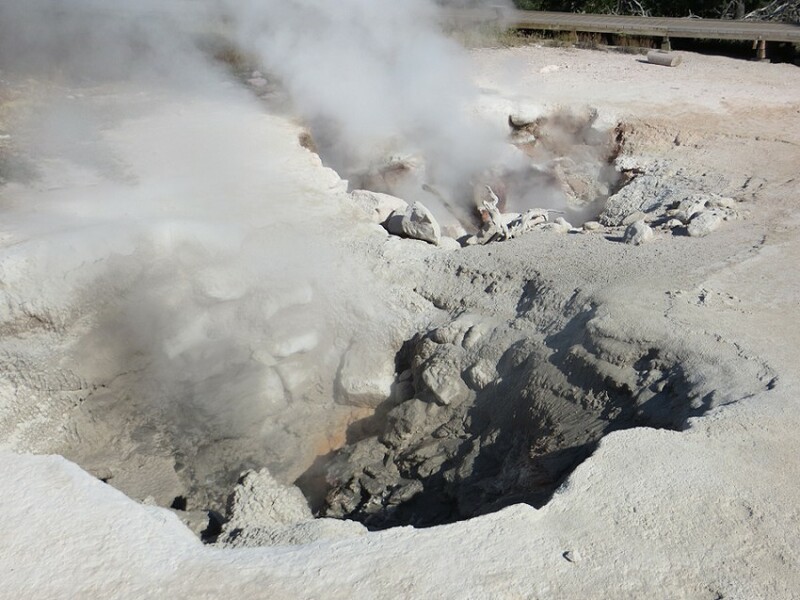 We also saw two large holes in the ground that had broken open from an earthquake a few decades back and out of which poured steam at a speed and sound like the exhaust of a jet engine. 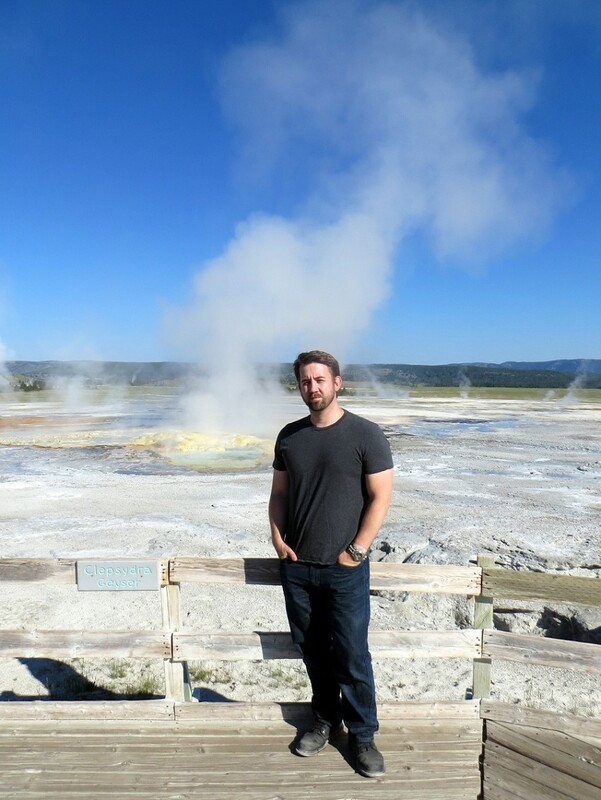 Yellowstone was turning out to be way weirder of a place than the all-American vacation destination that I had kind of filed it as in my brain. For comparison, all of our stops at Glacier National Park made me want to pull out a picnic lunch. Here, I felt we needed to pull out gas masks and race back to our families before society collapsed. I don’t know if this is coming across in this post because of all of my apocalyptic terminology, but we were having a blast at the park. Unfortunately, we had only two more stops before our too-brief Yellowstone jaunt was over: Grand Prismatic Spring and Old Faithful itself. This sign was everywhere. I love it. They need to sell it in the gift shops.